Nollywood star actor, , was abducted by kidnappers at Afor-Nkpor in the Idemili North Local Government Area of Anambra State on Sunday. No fewer than three persons were said to have been shot dead on the spot for allegedly trying to foil the kidnap. Nollywoodgists.com gathered that Edochie was just returning from Asaba in Delta State and was passing through Afor-Nkpor, along the Old Enugu/Onitsha road, when the kidnappers intercepted his Sport Utility Vehicle (SUV) and whisked him away. Mrs. Rita Edochie, also a Nollywood star and wife of Pete's younger brother, Tony, told nollywoodgists.com in a telephone chat that the kidnappers dropped Pete's personal assistant, his driver and the vehicle, shortly after the kidnap and zoomed off with Pete in their own car. She said the whereabouts of the abductors and their victim remained unknown as at press time. Pete's SUV had been recovered by the police, but the kidnappers had not called to demand a ransom. The State Commisioner of Police, Mr. Uzor Amakulor, who confirmed the incident on Sunday evening, said efforts were being intensified to track down the kidnappers and rescue their victim. He restated his earlier warning that kidnappers and other criminals in the state should have a change of heart or be prepared to face the music. Speaking on the ugly incident, Barrister Ezenagu, chairman of the Anambra State Chapter of the Actors Guild of Nigeria (AGN), said it was an unfortunate event. “Yes, was attacked and kidnapped this Sunday afternoon, at Nkpor Junction, while in a car with his driver. 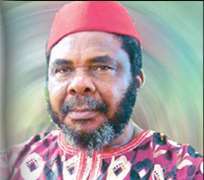 Edochie, from Nteje, in Oyi Local Government Area of Anambra State, who is also known and addressed as Ebubedike, is always remembered for his evergreen role of Okonkwo, in the television adaptation of Chinua Achebe's Things Fall Apart. Edochie, 62, was a civil servant, who rose to the position of director of programmes, Radio/TV in Anambra State, before retirement. He immediately embraced full time acting in Nollywood thereafter and has since acted in over 100 movies.